Comm Eye Health Vol. 31 No. 102 2018 pp 43. Published online 22 August 2018. CEO: International Joint Commission on Allied Health Personnel in Ophthalmology (IJCAHPO), Minnesota, USA. Chairman: Department of Ophthalmology, University of Cincinnati, ICO Director for Education, IJCAHPO Secretary for International Affairs, Cincinnati, Ohio, USA. With the increased need for eye care services worldwide, educators must approach curriculum design and teaching in a systematic way with a clear goal in mind: education of the whole eye care team, with specific competencies, to work together effectively to provide high quality patient care. 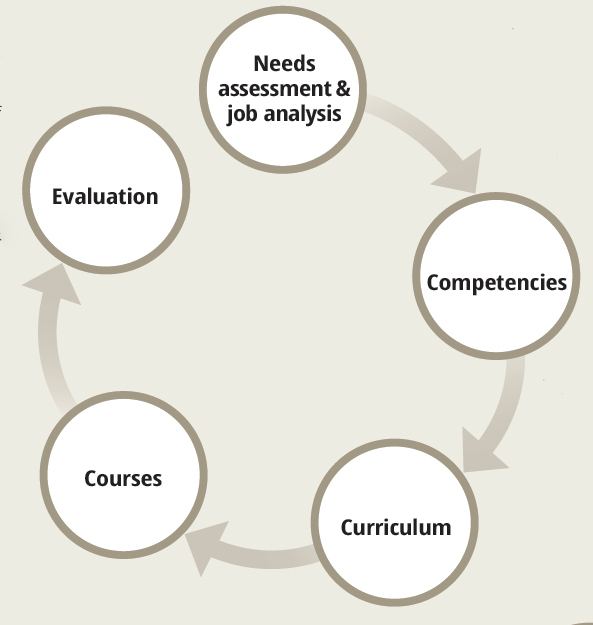 Developing or adapting training programmes for the different personnel in the eye team follows the cycle shown in Figure 1. Figure 1 Developing appropriate and relevant training programmes. The first task is to perform a needs assessment (i.e., which key competencies must the eye team be able to perform in order to ensure high quality care for patients?) and a job analysis (i.e., which roles are best suited to take responsibility for the required tasks?). Shifting tasks appropriately can improve productivity. Knowledge: What must they know? Skills: What must they be able to do? Attitudes: What motivates them to learn and perform? The answers form the ‘intended learning outcomes’ determines what and how they should be taught and assessed (the curriculum) and then organised within manageable building blocks (as courses or modules). The final component is evaluation of the training programme to check whether it had enabled eye care personnel to attain the relevant competencies. Internationally established standards of practice and assessment, such as IJCAHPO’s core progressive and specialty certifications and ICO’s core curriculums, facilitate a standardised approach to guide training programmes. As the need for eye care changes and develops over time in a particular population, the cycle is used to revise and review the curriculum and competencies.